The session on Thursday remained quite lackluster as the Markets headed nowhere and spent the session in a narrow range. The benchmark NIFTY50 oscillated in a 30-point range and finally settled the day with a modest loss of 3.90 points or 0.04%. The Markets continued to consolidate and going ahead for trade on Friday, we expect this consolidation to continue. The levels of 10490-will continue to pose serious resistance and given the extended weekend this time, we will also see some cautious outlook weighing on the Markets. For any serious up move to occur, the Markets will have to take out the levels of 10490 comprehensively and this may not happen too soon too fast. 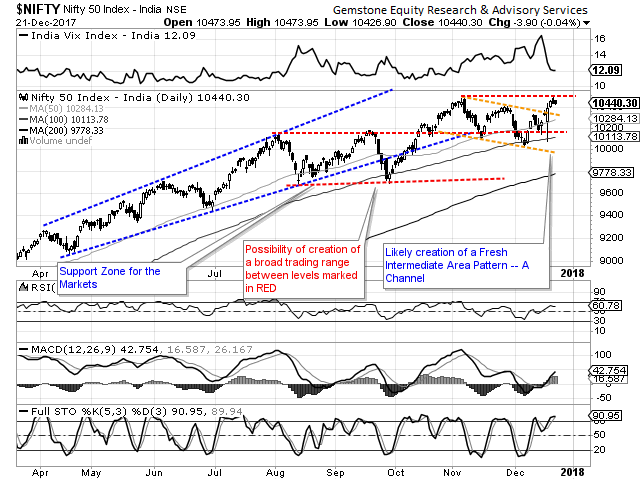 The levels of 10490 and 10535 will continue to pose serious resistance to the Markets. The Supports come in much lower at 10375 and 10280 zones. The Relative Strength Index – RSI on the Daily Chart is 60.7827 and continues to stay neutral against the price. The Daily MACD is bullish while trading above its signal line. No significant formations were observed on Candles. While having a look at pattern analysis, the NIFTY has comfortably moved outside the falling channel and have tested the 10490-mark on expected lines. However, given the overall structure on the Charts, we are likely to see some more consolidation happening before we see any comprehensive and sustainable breakout. Overall, it is also worth taking note that the short term 20-DMA has cut the 50-DMA from above. The interpretation of this is that if this continues and if the 20-DMA slips significantly below the 50-DMA, it can signal loss of momentum for the Markets in the immediate short term. With Monday being a trading holiday, we are likely to see consolidation happening on a cautious note in the Markets. 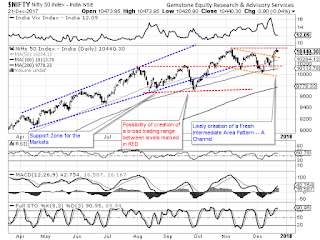 It is required that the Markets are approached with a highly stock specific focus and on a very cautious note.